My name is Christine, I am from Long Island, New York. 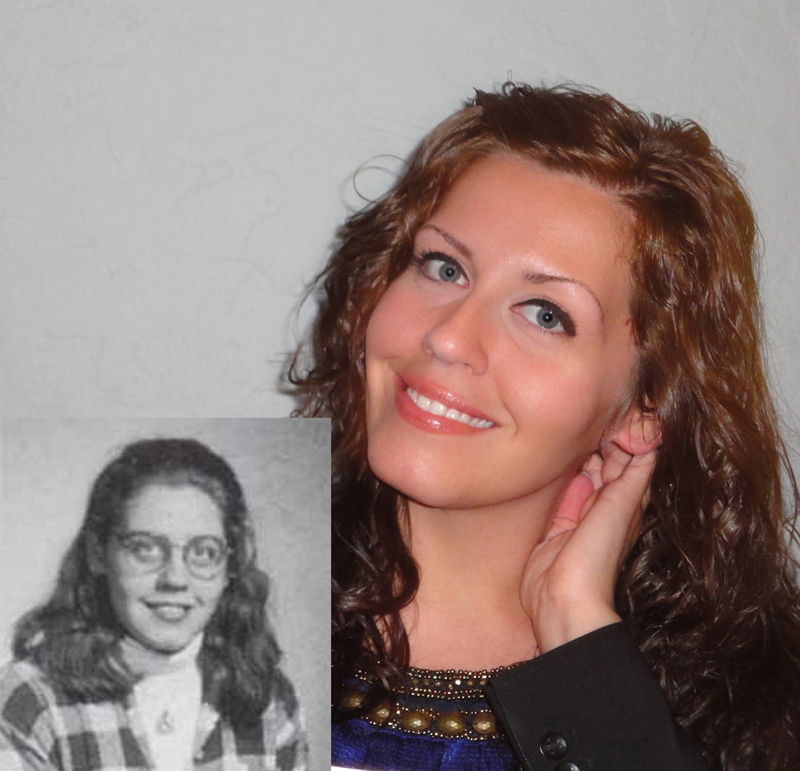 This is me now with my my 7th grade yearbook picture. Unfortunately, for our Senior yearbook, my high school decided to feature the 7th grade picture along with our senior portrait. Memories! My Mother passed away when I was seven years old; my Father had no idea how to raise 2 little girls by himself. From 3rd grade through middle school I had frizzy mullet haircuts, huge bottle cap eyeglasses and stirrup pants with turtle neck shirts in every color of the rainbow. In 7th grade I developed a love for flannel shirts, so what better way to improve my popularity than to combine the flannel and turtle neck! Oh and I don’t know if you can tell, but I was born with a fairly large brown birthmark in the middle of my forehead. Since my Dad was not equipped to raise children on his own, we moved in with his mom, my beloved Grandma, and my sister and I were spoiled rotten due to my Mom’s death. As a result, we were seriously overweight; by the time I was 15 years old, I was tipping the scales at almost 190lbs. I was made fun of daily for my weight and my birthmark by a group of boys. Whenever I was made fun of, I would cry, and the crying would only prompt more making fun of. The girls in school just pretty much ignored me, but I had my small group of “smart girl” friends so I just embraced being a fat nerd. The only time boys were nice to me was when they wanted to partner with me in class to improve their grade on an assignment. Did I mention that my alcoholic Dad and his string of drug addict girlfriends also made fun of my weight? In 9th grade my best friend and I joined a professional weight loss group and lost weight together. Due to the years of torture I endured at the hands of my peers, I took my weight loss to the extreme and ended up quitting the weight loss program and stopped eating completely by the time I was 16 years old. I got down to 113lbs for my Sweet 16. The same boys who made fun of me for being fat now made snide comments about how skinny I was and that all my clothes were too big. I developed the telltale signs of anorexia, like the peach fuzz that grows all over your body and amenorrhoea. I was out sick from school for almost half of the school year and by some miracle did not get left back. During my college years I resumed a somewhat normal eating/workout schedule, and I had the birthmark surgically removed from my forehead. I guess it was in college, when I went away upstate New York to study Mathematics, that I grew into myself, removed from the stress of my family, and learned more about dressing up, hair and makeup from my college girlfriends. Boys started noticing me for my gorgeous smile or pretty blue eyes, but my body image was and still is a daily struggle. Soon after I graduated college my Dad passed away from heart failure related to years of alcoholism, and I continued to put weight back on. I was up to around 160lbs again when I realized that I needed to just get over the years of bullying I endured at school and at home. I met my husband around this time and started taking pride in my intelligence and what I now realize is a pretty face, I developed a confidence in myself I’ve never had. I am one of those textbook pretty girls who has the fat girl personality, but I love running into guys from high school now who do not recognize me and cannot believe I am the same person who they used to get A’s in class 15 years ago. Anorexia (or any eating disorder) is not the way to go if you are bullied for your weight. I am still suffering the consequences of my choices: my breasts did not fully develop, I have an extremely slow metabolism and the peach fuzz never went away. I still wear eyeglasses, but thankfully I am an adult now and can choose to pay extra for the more stylish pair. Everyday I have to remind myself that my body is a gift and it is the only one I have, so I have to treat it right. One of the boys who made fun of me messaged me on Facebook recently, apologizing for how he treated me, another one asked me out before I was married. Kids and teenagers are selfish and mean, all that bullying means nothing to me today, I wish I had known that it was nonsense back then. Don’t let bullies ruin your life – one day you will look back on the bullying and it will seem like something you read in a book, the life of a fictional character, and you won’t believe that character wasted their childhood away worrying and crying.